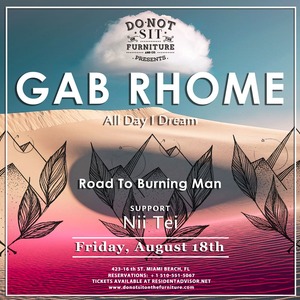 Friday, August 18th, Do Not Sit On The Furniture presentsGab Rhome[ Anjunadeep / All Day I Dream]SoundCloud [ https://m.soundcloud.com/gabrhome ]Support by:Nii Tei------------------------------------------------------------------------------------Gab, the former outsider numero uno and rock/ska kid at the party, has after only a hand-full of years dedicated to the art of production amassed quite the armada of label credits, including Anjunadeep, All Day I Dream, Get Physical, Supplement Facts, Last Night on Earth and more.Gab Rhome began his musical journey at an early age playing multiple instruments while shaped by jazz music from the likes of Vian, Davis and Zoot Sims. As a young teenager his influences progressed further toward shoe-gaze and electronic music, and inspired by artists like James Holden whose sounds exhibited a crossover between dance music and experimental rock he started experimenting in the studio on his own.The Montreal-born musician currently focuses on dreamy and hypnotic electronic music, best suited for warm bubble baths accompanied by your best friend's woman. His delicate melodies resonate best when coupled with his organic percussion, similar to the relationship between a proper bottle of wine and some classy tenderloin.